Each Far East Flora Pte Ltd plant arrangement is designed and delivered by our professional staff. While we guarantee the delivery of high quality product every time, substitution may be necessary on occasion due to the seasonal nature of plant and flower condition. If you order our ready-made plant combination or design and a plant in the scheme is unavailable, we reserve the right to replace it with something similar. 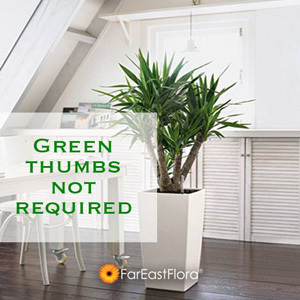 You can rely on us to choose a plant that is not only of a comparable size and price but one that will fit into the overall design that we have worked out for you. Please note that photos and images shown on our website are for illustrative purposes. Actual colour, size and look may vary due to the different image resolution used on screen display. Especially flowering and foliage plant has its own unique natural look that will differ from one another.